My fiancee, Danielle brought this site to my attention. If you are a cosplayer, you'll probably love this site, www.cosplayhouse.com. Just a quick browse of their store shows some amazing detail in their costumes. The selection is really good and there's even costumes for characters that only wore them in only say one or two episodes 0_O They are located in California so its a great source for us US anime fans who still tend to get the short end of the stick. 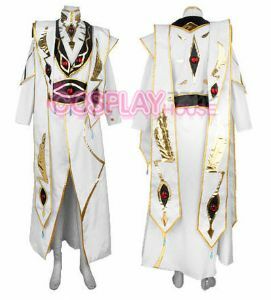 The LeLouche Emperor costume shown below is definitely on my wish list.